Low prices. OrangeSmile.com offers car hire service in Peru on the lowest-rate-guarantee basis, since we work with car suppliers directly. For your search criteria in Peru, we always select and show the best rental offers. The car reservation process consists of 3 simple steps: (1) search for available cars for your dates in Peru; (2) select your car type; and (3) fill in the booking forms. Once the reservation is completed, you will receive a confirmation voucher to your email address. During the booking process, please check your rental conditions. To pick up your car at the rental point in Peru, you need to provide our confirmation voucher, your driving license and a valid credit card. The final payment is normally carried out at the pick-up point. Our car hire points in Peru accept VISA, MasterCard, etc - please check your rental conditions. At the pick-up point, please read the handling manual and check the car for present defects. 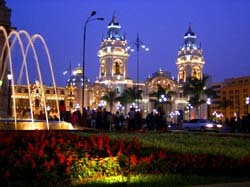 OrangeSmile.com wishes you a pleasant journey to Peru! The car hire reservation system OrangeSmile.com allows renting a vehicle in Peru within 10 minutes. Our largest database of car suppliers enables us to provide you a rental car in Peru at the cheapest rate ever possible. At rental locations in Peru we offer the following car sizes: mini, compact, economy, standard, premium and luxury. The following car types are available in Peru: Sedan, Hatchback, Jeep, Cabriolet, Coupe, Minivan and Minibus. Every region in Peru is characterized by its unique nature landscape. In this country one will find lifeless desert, snowcapped mountains and dense forests. There are also several interesting historic landmarks here. Visiting them will help travelers know more about rich culture and heritage of Peru and its people. Cahuachi, a major ceremonial center of the Nazca culture, is an internationally famous archaeological finding. The complex is located in the Nazca Desert. Cahuachi consists of numerous mounds with numerous religious buildings constructed on top of them. According to archaeologists, several thousand years ago Cahuachi was the largest center of pilgrimage in the country. The worldwide famous Nazca Lines are located nearby. Added to the list of UNESCO World Heritage Sites, the Nazca Lines attract scientists from all around the world. They try to solve the mystery of creation and purpose of the geoglyphs. Huilcahuain Temple is a beautiful example of ancient architecture. The complex of temples was constructed in the 10th century and is conditionally divided into two levels. No kind of glue was used to keep the giant stones together, so it's a true miracle that the temple was not damaged during several devastating earthquakes. Inner premises of the temple consist of a complicated system of rooms and underground pathways, and from the outside the walls are decorated with big drawings of animals and birds. Palacio de Torre Tagle is one of the most famous landmarks of the medieval period. The palace was built in the beginning of the 17th century and is considered an amazing example of the baroque style. The palace charms visitors with its elegant design and skillfully selected furnishing. The ground floor of the building is the location of a giant hall that has become a traditional venue for various important events and governmental meetings. Excursions to Raqchi region are traditionally very popular with tourists. During the Incan period a big city was located here, but now tourists can mostly see the ruins and several buildings - a big temple dedicated to Viracocha and several houses. There is a big man-made water reserve near the temple, and the purpose of this reserve is still a mystery. When it comes to describing religious landmarks of Peru, it's simply impossible to fail to mention the Temple of the Moon, which has become internationally famous because of beautiful frescoes that are used to decorate halls of the temple. The facade is also decorated with drawings depicting ancient gods, patrons of earth and fertility. The inner yard of the temple is no less interesting as tourists will find several religious facilities there. Many centuries ago they were used for sacrificial ceremonies. All reservations should be cancelled through our system only. This can be done by using the link indicated in the bottom of your voucher. Cancellation made directly in the Peru rental office is not considered valid.